This movie is in the boxset Gorehouse Greats Collection that I bought a year or so ago. Granted I got the set very cheap... but the quality of this video is more then lacking. There was actually green, blue, red and white vertical lines off and on through-out the entire movie! I sure hope that the other 11 movies in this set looks better then this one. I got to say this movie didn't impress me all that much. First of all this is a vampire movie (plus some). And what do we get from the vampires? Sitting around the castle talking and drinking their blood from glasses. This movie looks to me like something that Mystery Science Theater 3000 would use for one of their shows. It would probably be more entertaining then the actual movie! Even with that said... there is some scenes here that peaked my interest... unfortunately when that was the case... they just couldn't keep up with it. 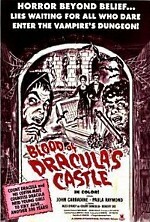 Watching this movie from (as I said) the Gorehouse Greats Collection... I have to ask... where is the gore? Hopefully the other movies in this set won't be so disappointing. In this year... The first episode of soap opera All My Children is broadcast... An earthquake (Richter Scale 7.7 magnitude) at Yunnan, China... U.S. ground troops withdraw from Cambodia... Jimi Hendrix dies. M*A*S*H would be my first pick. From your unwatched, I'd go with Love Story, but it is unlikely that you will like it. Whatever I pick... it won't be tonight But I was actually thinking about Black Brigade... it is a war movie... a TV Movie that has Richard Pryor (I would think in a serious role) and Billy Dee Williams in it. Has anyone here seen it? Worth a look? I would consider M*A*S*H... but it hasn't been that long since I watched it. So not sure I could get in the mood for that one again so soon. Terror is the best movie in this set. Satan's Slave, Stanley, Nightmare in Wax and Terrified are good too. Trip with the Teacher is great but they used an inferior print. Thanks Jimmy... Will keep that in mind. BTW Jimmy... do you have any problem with the Gorehouse Greats Collection playing in your DVD Rom? They play fine in my standalone DVD Player... but refuse to play in my DVD Rom... just curious. Mine play without a problem on my computer, except the reader make a lot of noise playing some of the disc (but not as much as those in the Mortuary sets). Must be my ancient computer set-up! I might be motivated to try this...though I'll have to see if I have all the years covered. I'm thinking I would. Then I'd have to find the time to watch them all. But I may join this.. I've been thinking the same thing. I like the concept ... but lately I've rarely been in the mood for movies, so it would probably take me a while to do..
As far as 2011 movies, it's probably too early. There aren't any available yet (I would think) that have actually first played in theaters this year. Wait until you get to this year, watching your other movies first, and maybe by then there will be some available. I was just looking and I think I have all the years covered...at least until 2011. So I'll probably do it too..just not sure how soon I'll get started. Same for me, but I really expect that Angle mort will be available on dvd when the time will come. I was almost tempted to go see it in a theatre - the film premiere was even in my city - but I decided to wait the dvd release (evidently the fact I panic when too many people are around me helped the decision). Sebastien have you seen it? Should we makew one of those collected threads where everyone posts the list of what they watch...? That could help to see how others are doing and what they are watching. Wh-What? did someone try to get my attention? No, I haven't seen it Jimmy... actually, I don't think I had even heard of it before now!